Reason: In the meantime, see our blog for details on the status of the legal entity. 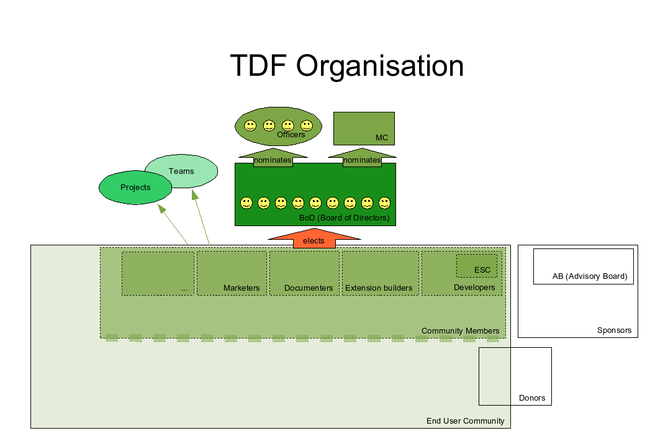 On this page we describe the organization of The Document Foundation (TDF) as it is in construction for now. The depencies of the inner side of the TDF will described by the CommunityBylaws. The official will be the German part in Community-Geschäftsordnung. TDF is commissarial leaded by the Steering Committee until the Foundation is funded and the institutions will build. The members of the SC will be found on the webpage of The Document Foundation. The Board of Directors is composed of 7 members; this figure does not include deputies. The Board of Directors is responsible for appointing the Membership Committee; it can also form any other ad hoc Teams or commitees, if such Teams or commitees are necessary. The Board of Directors is the Foundation's Board of Directors and the main steward of the Foundation's Projects and Teams. Each Director is elected by the Community Members, during an election process involving the entire Community (refer to Voting to Elect Members of the Board of Directors). Each member of the BoD must appoint one Community Member as deputy who can replace her/him in case of need, and who has the same rights during her/his period of absence or unavailability. A deputy does not have to be elected, but his/her name must be publicly published as the deputy of a particular BoD member. The duties of the BoD are wide-ranging, extending from administrative duties and other duties specifically tied to the Foundation (refer to the clauses covering interactions between the Foundation and the Community governance) to strategic planning, funds allocation, financial oversight, trademark ownership management, dispute settlement, Community guidance, etc. The BoD can set-up as many committees, Teams and Projects as it deems necessary. The Chairperson (CH), the Executive Director (ED), the Financial and Legal Officers are also nominated, appointed and discharged by the BoD. The BoD can also appoint additional Officers in addition to the Foundation's 4 principal Officers. See more at our official TDF website. The Membership Committee is staffed by members who are appointed by the Board of Directors. The mission of the MC is to administer membership applications and renewals, and to oversee the election of the BoD, under the authority of the Chairperson. The composition, form, and processes of the Membership Committee can be changed by the BoD after a vote by the BoD members. The Membership Committee is nominated by the Board of Directors. The members and their deputies are listed here. The Engineering Steering Committee provides technological guidance on strategic matters and, hypothetically, will be composed of the Community's best engineers. This committee is not elected: instead, the members are appointed by the Developers Team. There is no limit on the number of members of the Engineering Steering Committee. The Engineering Steering Committee incoporates currently 10 members nominated by the Steering Committee out of the members of the developer community. The Advisory Board represents the Foundation's Sponsors. Each Sponsor's representative is appointed for a term of one year, but can be re-appointed for a further year in office at the end of each term. The AB's primary function is to represent The Document Foundation's Sponsors, and to provide the Board of Directors with advice, guidance and proposals. The Chairperson is in charge of representing the Foundation. The Chairperson's role is mainly detached from the daily activities of the Foundation and its Projects and Teams, but he/she can liaise with the AB and the BoD on any matter he/she deems necessary, and is briefed by the Executive Director. The Chairperson can intervene in dispute resolution and can take part in overseeing the process for nominations and elections of candidates for the BoD. The Chairperson cannot be a member of the BoD or the AB. The Chairperson is nominated by the BoD, either by a consensus of the BoD members, or by a means of an ordinary vote among the members of the BoD. This vote does not have to be public. There is no limit to the time a Chairperson can serve. The Executive Director is an Officer of the Foundation who is in charge of running the Foundation's daily operations, and of implementing the strategy developed by the BoD. The ED liaises with the various Teams and Projects, and ensures that all facilities made available for the activities supported by the Foundation are provided in a satisfactory manner. The ED can attend each meeting of the BoD, but has no voting rights. The Executive Director cannot be a member of the AB or the BoD. The ED supervises the activities of every other Officer of the Foundation except for the Chairperson. The ED has to liaise with the Foundation's Chairperson on a monthly basis, and has to brief the Chairperson on the activities managed by the Foundation. The ED is accountable to the BoD for the fulfillment of his/her duties. He/she has to brief the BoD on the Foundation's mission and the activities it runs. The Community's Members are people who contribute their time, efforts and skills independently (individual persons contributing on either a paid or unpaid basis), or who may work for Sponsors (refer to definition of Sponsors ). Members are commonly referred to as "Community Members" or as "Community Contributors" (or as "XYZ Team Members" or "XYZ Project Members"). To become a Member of the Community, you have to make tangible or traceable contributions for a certain time and to a certain extent. Membership applications are evaluated by the Membership Committee on the basis of these criteria. For more information about the applying look at "How to apply for membership". The Community-Members are published on the website. Now we come to a quite difficult term. The Community is the body of Members currently recognized and accepted by the Membership Committee. The Community as a whole is made up of sub-communities (developers, extenders, documenters, marketers, etc. ), and is referred to separately from the greater community of users of the software we produce (the "end-user community"). This page was last edited 22:17:56, 2018-05-02 by Dennis Roczek. Based on work by cornouws and Klaus-Jürgen Weghorn and others.